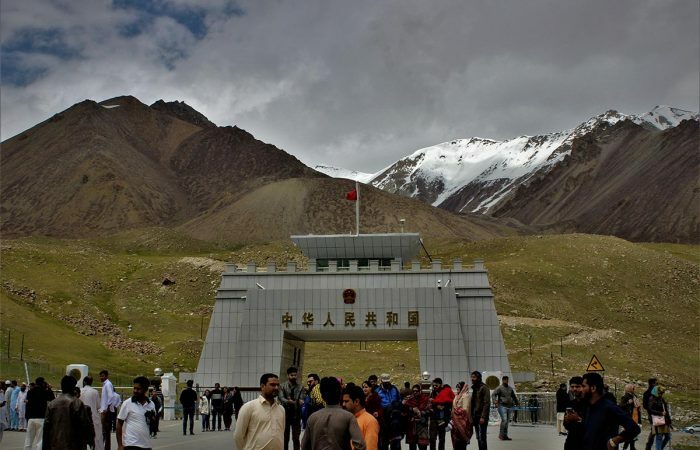 Pakistan shares its borders with Afghanistan, China and India. 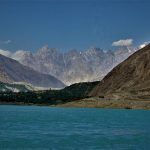 Northern Pakistan is a region of amazing ethnic diversity and immense natural beauty, still to be discovered by travelers. 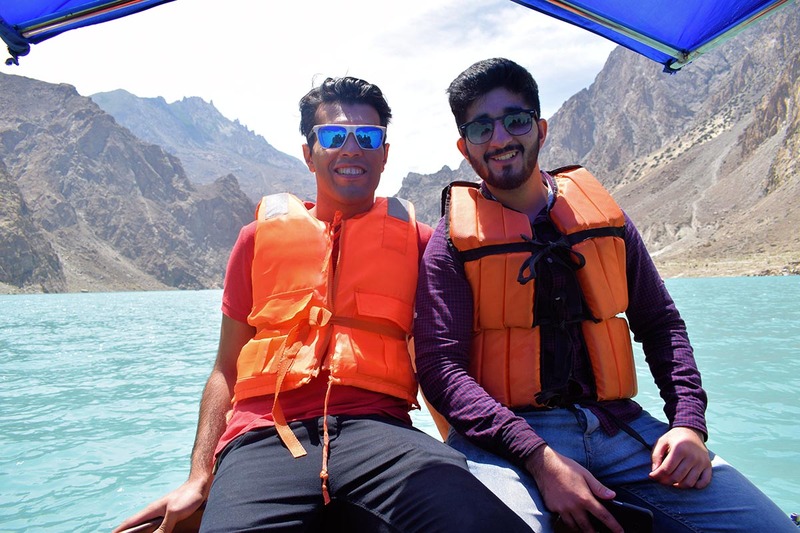 Whether wandering the bazaars of Lahore, haggling with Pathans in Peshawar, taking the mesmerizing views of Hunza or drinking a cup of tea at the base of Nanga Parbat in Fairy Meadows; one can enjoy and admire the natural and cultural densities of this fascinating country. 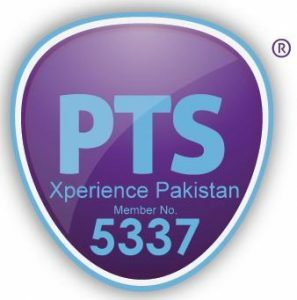 Our professional staff will take you on an expedition to the unseen paradise of Pakistan. Join us on a journey into a land whose very breadth and beauty will fill even the most seasoned traveler’s heart with a sense of wonder. * Private tours can also be arranged and adapted for your needs and budget. Islamabad is the modern capital city of Pakistan. Located on the Potohar Plateau and lying at the foot-hills of the picturesque Margalla range, Islamabad is a portrait of scenic serenity. Visit Museum in Lok Virsa, the Heritage Museum is the first state museum of ethnology in Pakistan which presents the history and living traditions of the people of Pakistan both from the mainstream and the remotest regions of the country. Railway Museum in Golra Sharif, this railway station is the site of a venerated Railway Museum housing the relics and memorabilia associated with railways dating back to the days of the British Raj. Faisal Mosque, Dinner at Daman-i-Koh. Visit the old Raja bazaar in Rawalpindi in the afternoon. Overnight at a hotel or guest house. Taxila: Sightseeing of ruins: Jaulian Monastery, Taxila Museum. Taxila is only about 30 kilometers from Rawalpindi, a little off the main highway. Steeped deep in history, the excavations at Taxila take you back 2,500 years into the world of Buddha, Alexander, Asoka and of course the Emperor Kanishka whose imprints are visible to this day. It is here that the world’s most interesting civilizations took roots. It is here that you find endless images of Buddha. You find these in stone and in stucco. Important stages of Buddha’s life are depicted in the numerous panels that have been uncovered here. This great man of peace is depicted in exquisitely carved sculptures and statues glorifying him and his life. Each one of these sculptures is a collector’s pride. Hassan Abdal (Sikh temple) – It is famous for Gurdwara Sri Panja Sahib, one of the most sacred places of Sikhism. Thousands of Sikhs visit across the world the Gurdwara on the eve of Besakhi every year. En-Route to Besham at Mansehra, we will have a short break to see Ashoka’s Rocks Edicts on boulders dating as back as 3rd century BC. Driving time is 10 hours with breaks and distance is 275 KMs, Besham is situated at an altitude of 850 meters. Overnight at a hotel. 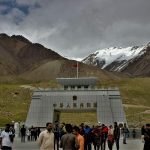 Drive KKH Besham – Chilas en-route stop at Shatyal rock inscriptions. 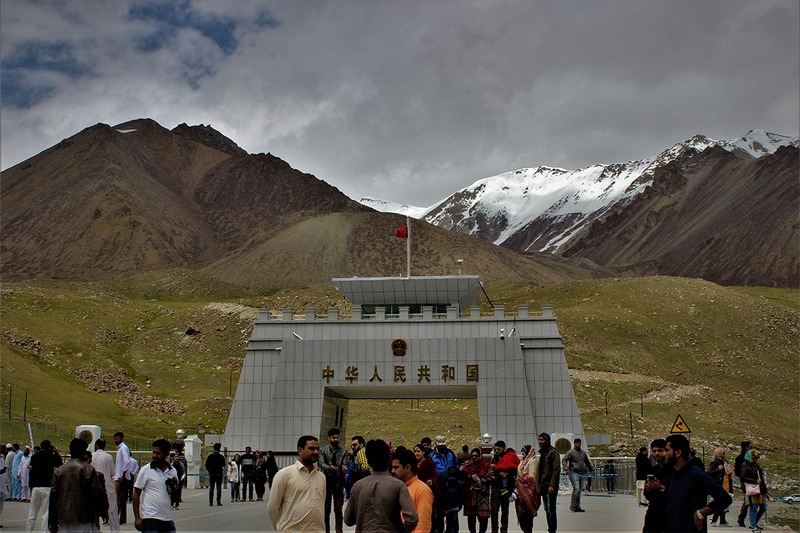 This morning, a life time adventures begins from Besham, leaving the green hills behind, we start driving our day in the black rocks on Karakoram Highway, carved by the brave hearts of Pakistan and China. At Shatyal we take a break to visit the rock carvings left by traders, Buddhist pilgrims and historians on their way to Taxila and Middle East. Overnight at a hotel. Drive to Raikot bridge (1.5 hr) where we will leave our car and take jeep to reach to Tato (2 hrs). From Tato there is another three hours trek to Fairy Meadow. 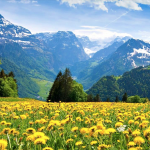 As we reach our camp late afternoon, we will take rest at an Alpine Hut surrounded by trees and lush green meadow. 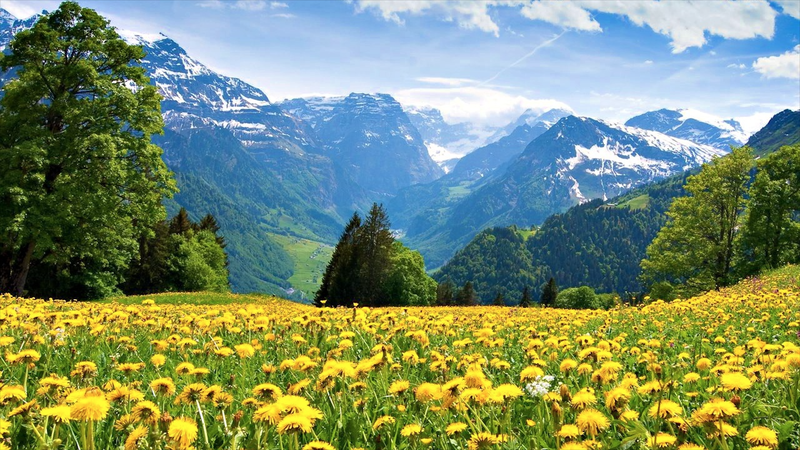 The beauty of this alpine meadow is more than its name describes. The view of Nanga Parbat from Fairy Meadow is a must see experience in life time. 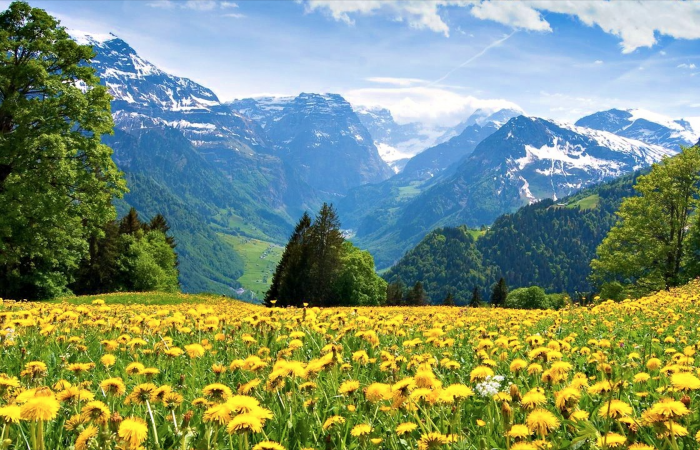 The panoramic scene mesmerizes people so badly that they don’t want to leave the camp and wish to spend more and more time. An optional trek of 5-6 hours to Nanga Parbat Base Camp is offered. 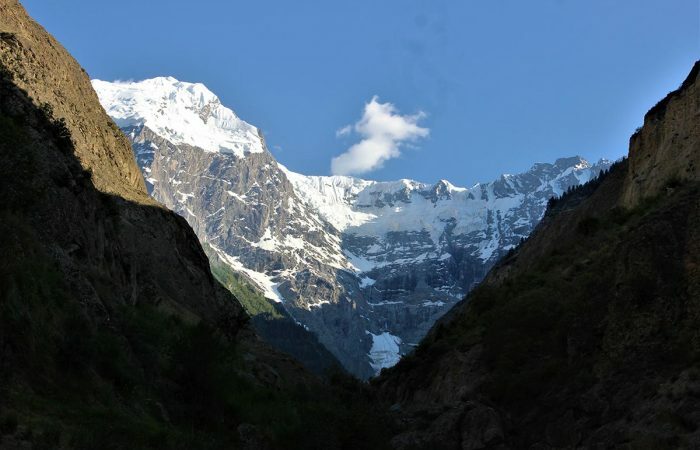 The trek is moderately difficult but majority of visitors prefer to take it. From Riakot Glacier when you look at your north you will see Indus Valley and Rakaposhi Peak. Beyal is a summer pasture too but with much lesser residents and tourists as compare to Fairy Meadows. 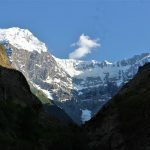 To get the best view you will need to walk half an hour further to the actual camp site from where you will be able to experience a closer view of Nanga Parbat (8125 meters), Chongra Peak (6820 meters), & Riakot Peak (7080 meters). We continue our treks on a steep trail through a forest which reaches at an open meadow. Then we enter into Ganalo Glacier finally reaching Nanga Parbat Base Camp (3970 meters) after three hours trek. 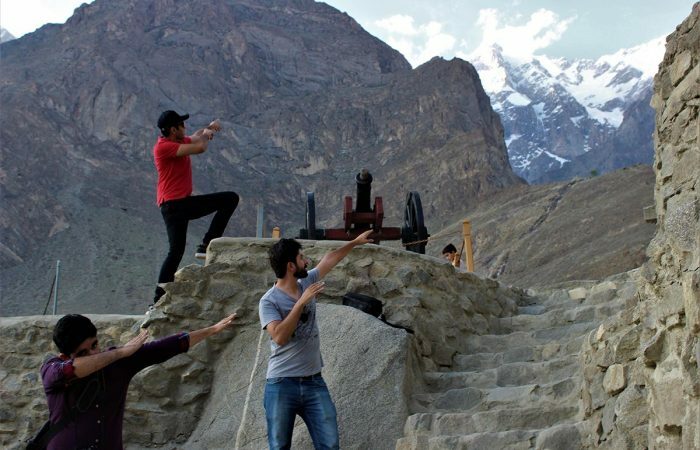 There is a memorial of climbers who lost their lives during early expeditions to attempt Nanga Parbat. Due to technical difficulties seldom any expedition attempts the peak from Raikot side now a day. After a cup of tea/short refreshment and photography we go down to Beyal and then to Fairy Meadow for overnight stay. Overnight an alpine hut. Trek to Tato and drive to Karimabad, the former capital of Hunza Valley, a princely state. 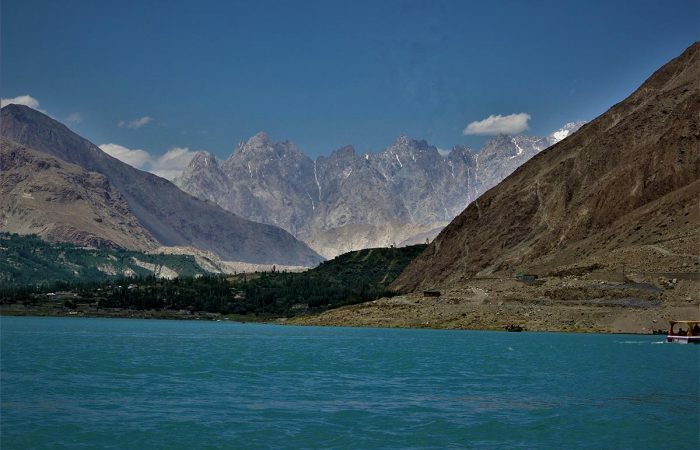 The natural beautify of Hunza valley and hospitality of its people is beyond description. We will rest in the afternoon at our hotel. We will start our day by visiting fairy-tale like castle of Baltit, above Karimabad, is a landmark built about 900 years ago, in 2004 tentatively enlisted UNESCO’s World Heritage. 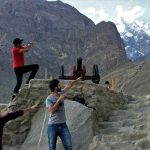 After visit of Baltit Fort, we will walk along Barbar irrigation channel with striking view of Karakoram mountains adds more essence to our journey. 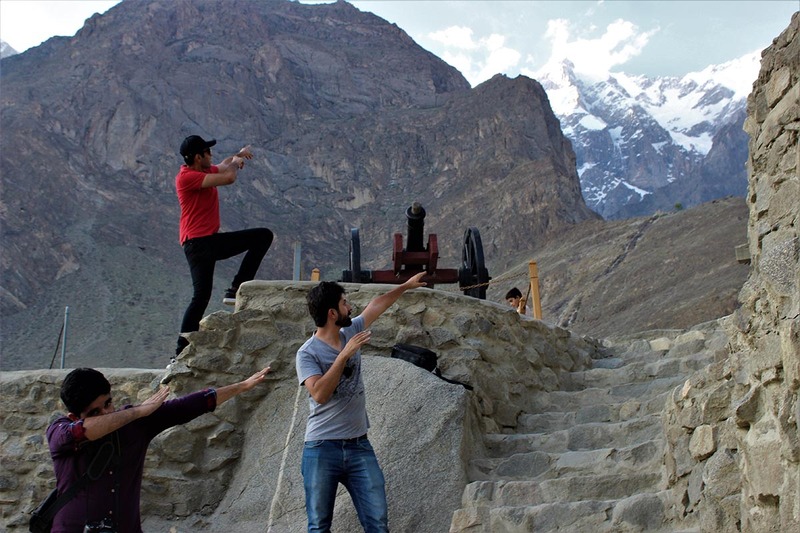 After lunch at a traditional Hunza home, we will visit Altit Fort and Duiker. We will witness the mesmerizing sunset view at Eagle’s Nest Duiker and an awe-inspiring view of Hunza. Duiker is situated at an altitude of 2935 meters high above sea level. Back to hotel in Karimabad for overnight. In the morning visit upper Hunza including Gulmit & Passu. Visit museum in Gulmit and walk around in the village. 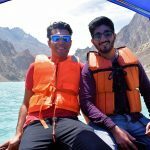 Drive upto Passu to Passu glacier, Passu Peak & Passu Cathedral. Drive back to Gilgit after lunch for overnight. In the afternoon visit Kargah Buddha. We will start early in the morning for drive to Besham (8-9 hrs). Overnight at hotel. We will continue drive to Islamabad from Besham (7 hrs). Drive to Lahore en-route visit to Rohtas fort which lies sprawling upon a low rocky hill to the north of Jhelum in a bend of the River Ghan (mostly spelled as Kahan). The gigantic fort is founded on steep rocks jutting into the river Kahan, its ramparts protected on the west and north sides by the river and by high hills on its east and south. It was never taken by assault and survives intact to the present day. The main fortifications consist of the massive walls, which extended for more than 4km; they are lined with bastions and pierced by monumental gateways. Overnight in hotel. Lahore has been the capital of Punjab for nearly 1,000 years. Besides being the Mughal show-window, Lahore is the cultural, academic and intellectual centre of Pakistan. For 200 years, beginning from about 1525 AD, Lahore remained a thriving cultural centre of the great Mughal Empire, when the city was beautified with palaces, gardens, monuments and mosques. During the British regime, many monuments sprang up in Lahore which blended beautifully with the Mughal, Gothic and Victorian styles of architecture. A full day city tour of Lahore includes a visit to Lahore Museum – a visit to the Lahore museum is a must for any local and international visitor to Lahore. The history of the Pakistan movement in photographs, the mural of Sadequain, and the treasures of Buddhist civilization are a treat. This museum has the best and largest collection of Buddhist carvings and the only original statue of the starving Buddha. The armaments section, area based on the Indus civilization and the utensils used in the Indus civilization are also of interests. Badshahi Fort – the Fort, locally referred to as Shahi Qila is citadel of the city of Lahore, Punjab, Pakistan. It is located in the northwestern corner of the Walled City of Lahore. The trapezoidal composition is spread over 20 hectares. It is the main point of interest in Lahore. Some details of the palaces remind one of the Taj Mahal. You feel the vibrant history and the grandeur of past times in every corner. Badshahi Mosque, for a long time it was the largest mosque in the world. Built by the Mughals, it is a living testament to the engineering and architectural grandeur of the Mughal era. The internal capacity of handling worshippers is more than 100,000. As you enter inside the mosque, the vast areas, marble arches, big minarets, marble floors gives you warm welcome. Wazir Khan Mosque – The Mosque is famous for its extensive faience tile work. It has been described as ‘a mole on the cheek of Lahore’. It was built in seven years, starting around 1634–1635 AD, during the reign of the Mughal Emperor Shah Jehan. It was built by Hakim Shaikh Ilm-ud-din Ansari, a native of Chiniot, who rose to be the court physician to Shah Jehan and a governor of Lahore. He was commonly known as Wazir Khan, a popular title bestowed upon him (the word Wazir means ‘minister’ in Urdu and Persian). The mosque is inside the Inner City and is easiest accessed from Delhi Gate. The mosque contains some of the finest examples of Qashani tile work from the Mughal period. Overnight stay in Lahore. The sightseeing includes a visit to Mausoleum of Emperor Jahangir –It is built by Jahangir, who ruled the Mughal Empire from 1605 to 1627. The mausoleum is located in Shahdara Bagh in Lahore, Punjab. The mausoleum is a single story structure. The ground plan is a square; the structure consists of a platform with a tall, octagonal tower and a projecting entrance in the middle of each side. The exterior of the mausoleum, including the lowest stage of the towers, is clad with red sandstone facing with rich panel decoration inlaid with marble decorative motives. Mausoleum of Noor Jehan – Noor Jehan born as Mehr-un-Nissa, was Empress of the Mughal Empire as the chief consort of Emperor Jahangir. A strong, charismatic and well-educated woman, she is considered to be one of the most powerful and influential women of the 17th century Mughal Empire. She was the twentieth and favourite wife of the Emperor Jahangir who ruled the Mughal Empire at the peak of its power and supremacy. She died on 17 December 1645 at age 68. She is buried at her tomb in Shahdara Bagh in Lahore, which she had built herself. The tomb attracts many visitors, both Pakistani and foreign, who come to enjoy pleasant walks in its gardens. Shalimar Gardens. The Shalimar Gardens were built by Mughal Emperor Shah Jahan, spanning over many acres of land. Shalimar Garden offers an amazing view over the other gardens, lakes and shallow terraces. There is also a canal lined with polished stones running through the centre of the Shalimar Bagh. The garden is also known as the “garden of love”. Flag Lowering Ceremony –this is something very unique where rangers from both sides of the border put up a fabulous display of parade & ritualistic flag lowering in charged environment with people chanting slogans for their countries. This is something you can only witness here! Amazing place to see people from both sides of the countries (Pakistan & India). Overnight in Lahore. Overnight in hotel. Transfer to airport for homebound flight. Driver, fuel, toll & parking etc.